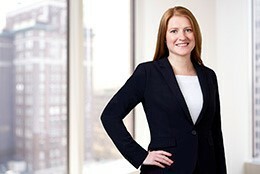 Kristen Harris is an associate in the Antitrust group in Axinn’s Washington, DC office. Kristen was a Summer Associate with Axinn in 2017. Her practice focuses on antitrust litigation, government investigations, mergers, and counseling. She graduated from Antonin Scalia Law School at George Mason University, where she worked as a research assistant to former Commissioner of the FTC, Joshua D. Wright, on a wide range of antitrust issues. During law school, she participated in a course at the Instituto Brasiliense de Direito Público in Brasília, led by CADE’s General Superintendent, Alexandre Cordeiro, entitled “Competition Law in Brazil: Challenges and Perspectives.” There, Kristen studied the structure and substance of Brazilian competition law and its underlying competition policy. Kristen also worked as a law clerk in the Bureau of Competition at the FTC, where she gained experience with government investigations of mergers and acquisitions. Prior to law school, Kristen served as a Logistics and Operations Clerk in the United States Marine Corps. Joshua D. Wright and Kristen A. Harris, “Hipster Antitrust Meets the Clayton Act: Proposed Merger Legislation Abandons the Consumer Welfare Standard” Threshold (Fall, 2017).